As many of you are aware, Ice Station Valencia is home to a Junior A Hockey program, the Valencia Flyers. The Flyers play in the Amateur Athletic Union and United Hockey Union's Junior A Western States Hockey League. The WSHL is comprised of teams from Los Angeles to Tulsa, Oklahoma and the players range in age from 16 to 20 years old. These players come from all over the United States, Canada, and Europe in the hopes of taking their hockey careers to the next level. With their passion for hockey in hand, these players will come and live in the SCV with a billet family from early September until the end of the season in April. Although our players come from all over the world and speak different languages, their common goal is to play the game they love at the highest level possible. 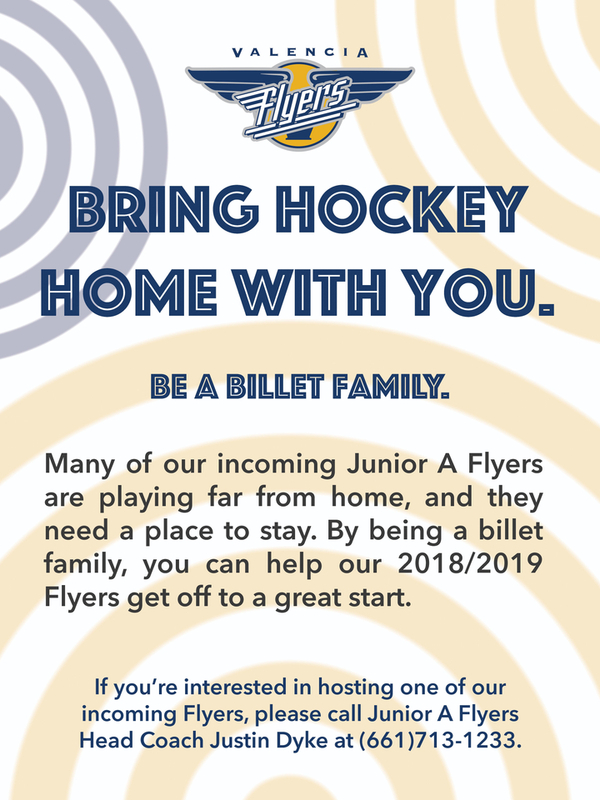 If you are interested in being a billet family this season please contact Ice Station Valencia to discuss this rewarding opportunity. A pre-established fee is to be paid to the billeting home through a series of checks that are to be pre-signed and dated and given to the billet family in advance. The date on each check is to reﬂect the ﬁrst of each month. Players staying with Billet families must observe the curfews as they are set forth by the Flyers Team Management. If a Billet family has a curfew rule that is stricter than the Flyers curfew rule, then Player must observe the stricter rule. a. Not only at your home, but everywhere, there is a zero tolerance policy regarding the use of alcohol, tobacco and/or any illegal substance. You will be asked to leave the team if this policy is abused in any way. No Alcohol (or illegal substance of any kind) is allowed to be consumed at any time by any Flyers player. No chewing tobacco is allowed to be chewed at any time. Smoking of any kind is prohibited. b. Foul language is a result of lack of discipline and must be severely limited. Any reports of such activity from a billet family will be severely dealt with. c. The agreed upon appropriate dress code will be in effect at all times with billeted players. d. The family you are staying with has graciously offered to make space in their home for you. There are bound to be things that occur within the home that will affect and bother you. You have to remember that it is their home and you need to respect their family (all of the members) at all times. Billet families must be held to a high standard in terms of being respectful. All billeting players must be aware of the importance of respecting everyone in the billet home. e. It is very important to be mindful of the fact that you are an extra person in the home. It is important that you be helpful while in their home by offering to do regular chores around the house. They will be very appreciative of it. Chores at the billet home are to be deﬁned and followed through by every player who billets. h. Your room or space is their space and it must be kept clean. You are obligated to conduct yourself in exemplary fashion while in someone else’s home. Pick up after yourself, by cleaning your dirty dishes, picking up dirty clothes, doing laundry and generally helping to keep the house clean inside and out where it applies. You understand that you are to communicate your whereabouts to your host family at all times. Do not assume they are aware of your schedule. You have, by default, limited use of the facility. You are not allowed, without written prior consent of the host family, to use the property for any other activity except as a personal lodging. This means no companions of any kind may enter the property without the permission of the host family. You also acknowledge that you have limited use to the personal property of the host family, and that all use of their personal property must be cleared with their permission before use. It is very important to be mindful of the fact that you are an extra person in the home and as such, things are more congested than normal for them. It is important that you be helpful while in their home by offering to do regular chores around the house. They will be very appreciative of it. Chores at the billet home are to be defined and followed through by every player who billets. You must vacate your assigned host family residence within 7 days after the last game played unless additional arrangements are made in writing between the team, the host family, and you. Your room or space is their space and it must be kept clean. You are obligated to conduct yourself in exemplary fashion while in someone else’s home. Pick up after yourself, by cleaning your dirty dishes, picking up dirty clothes, doing laundry and generally helping to keep the house clean inside and out where it applies. It is the responsibility of Player to arrange for all transportation to and from all home games, practices and team functions. Billet families are allowed to get involved wherever necessary and appropriate.